It is said that Vajranabha, the great-grandson of Krishna had 16 deities carved. It is said that these Deities were carved from a rare, imperishable stone called Braja. The four presiding Deities of Braja Mandala are Sri Harideva of Govardhan, Sri Keshava Deva of Mathura, Sri Baladeva of Baladeo, and Govindaji of Vrindavan, who has now been moved to Jaipur. There are two Naths—Sri Nathji, who was originally at Govardhan and is now in Nathdwar, Rajasthan, by Udaipur, and Sri Gopinath, who is now in Jaipur. The two Gopals are Sri Madana Gopal, renamed Sri Madana Mohan, who is now in Karoli (Raj), and Sakshi Gopal, who is now in the town of Sakshi Gopal, Orissa, near Puri. The four Mahadevas (deities of Lord Siva) are Chakleswar at Govardhan, Kameswar at Kamavan, Bhuteswar at Mathura, and Gopiswar in Vrindavan. 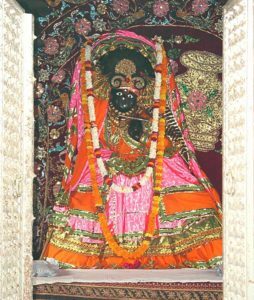 The four goddesses carved are Manasi Devi at Govardhan, Vrinda Devi at Kamavan, Pathal Devi at Mathura, and Yogamaya Devi at Vrindavan. It is said that Vajranabha first had three Deities of Krishna carved. He never saw Krishna, so they were carved from the description of Uttara, the mother of Maharaja Pariksit. He had three different images carved, but none of them were perfect. Govindaji resembled the face, Madana Mohan resembled the navel down to the lotus feet, and Gopinath resembled the trunk of the body, from the navel to the neck. Sri Govinda and Sri Gopinath are now in Jaipur and Madana Mohan is in Karoli, a small town in Rajasthan.